Construction on the multipurpose £23m complex, located on the city’s Longman Road, got under way in March earlier this year to create what will become the country’s first Justice Centre. The building will comprise six new court rooms which will be fitted with the very latest in modern technology. 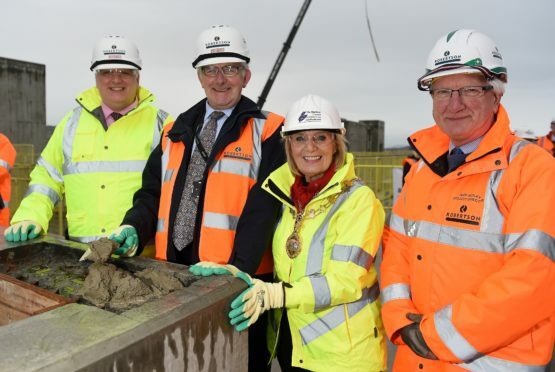 To mark the important milestone, Scottish Courts and Tribunals Service Chief Executive Eric McQueen was joined by Provost Helen Carmichael, Sheriff Principal Derek Pyle and Jeff Hedley, Robertson Northern Project Director for a “topping out” – where the final beam is put in place – ceremony on the roof. Mr McQueen said: “It will be a landmark building without a doubt in Inverness. I think it’s one that will capture people’s attention as the come into the city and hopefully what we think is it will change the way we deliver justice. Construction on the building is due to be complete by next year, with doors expected to open by Spring 2020. Citizens Advice Bureau, NHS Highland, Police Scotland and Scottish Women’s Aid are just some of the services that will have a working space in the centre.